SallyStrawberry: Maths, environmental science....and crochet! Now I am a few years behind on this but thought it was definitely still worth a share. Having decided to tackle my bloggers block head on I sat down at my computer a couple of hours ago and hit Google with search terms something like this 'overcoming bloggers block'. I came across this page by social media gurus 'Social Media Examiner' listing ways to gain a bit of inspiration etc. One of the points suggested watching some TED talks or podcasts for inspiration. Heading over to TED.com I searched for 'crochet'. Not expecting any results I was surprised to get a result- a talk by Margaret Wertheim on her crochet hyperbolic reefs. 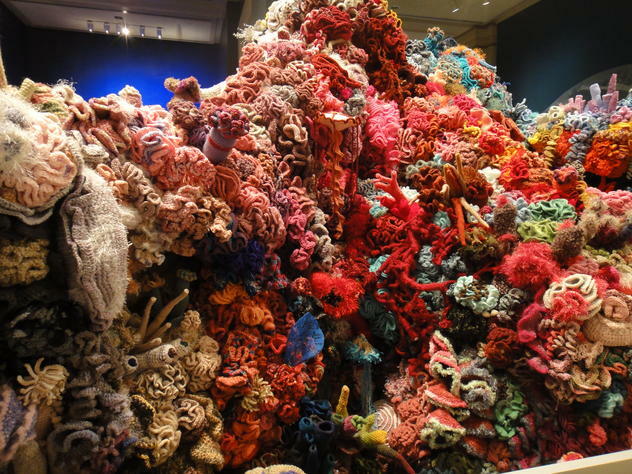 I have seen some crochet hyperbolic reefs in a gallery in London, and they were fabulous! This project, started by Margaret and her sister about 10 years ago has spread globally, uniting people through their love of crochet and the environment. The project has also lead to great breakthroughs in mathematics but I'll leave Margaret to explain that one to you! Have you seen, or been involved in this project? If so I would love to hear your experiences.